Looking to create a Jungle Safari cake for your next birthday party or baby shower? This page features a nice selection of specialty animal themed cake and muffin pans. A Jungle Safari party would make a great theme for a birthday party or baby shower. If you are hosting an animal themed celebration, there are many Jungle Safari cake and muffin pans featured here that would be perfect for your party treats. The pans listed here are from popular cake supply manufacturers including Nordic Ware and Wilton. Some of the Jungle Safari cake and cupcakes you can create include elephants, monkeys, giraffes, hipps, rhinos, alligators and more. I have also included Wild Animal Print cake and cupcake supplies here as well including zebra, leopard, cheetah and tiger. Unique muffin pans for mini cake treats and even ice cream! I love these Jungle Safari pans from Nordic Ware. They will help you to create adorable, mini treats for each of your party guests. Your guests, especially kids, will love to having their own personal cake. The first item pictured here is the Nordic Ware Pro Cast Zoo Animal cake pan. 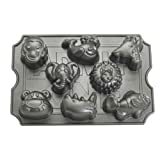 This cast aluminum cake pan features a non-stick coating and eight fillable zoo animal cavaties. 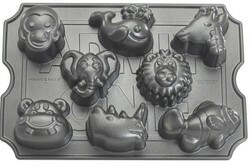 The jungle animal treats you can bake with this pan include a monkey, giraffe, elephant, lion, hippo, rhino, whale and fish. Simply decorate the finished mini cakes with icing and they are ready for your party! The next item is the Hungry Animals Cake and Ice Cream Pan from Nordic Ware. This pan makes five cakelets including a lion, monkey, hippo, alligator and elephant. After your cakes are baked, you can fill the open mouths with ice cream. Everyone will love this! 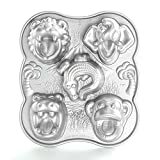 You can create an elephant, lion or monkey with these specialty cake pans. If you would like to incorprate one specific animal into your party treats, the Wilton cake pans below would be great. The specialty cake pans include a monkey, a lion and an elephant. Each of these Wilton cake pans come with complete baking and decorating instructions. These cake pans are super cute and would be perfect for a 1st birthday party or baby shower. Make Jungle Safari Pancakes for your Celebration! For your sleepover birthday party or baby shower brunch. If your child is hosting a Jungle Safari sleepover party, this Zoo Animal pancake pan would be perfect for serving a wild animal breakfast the next morning. 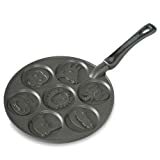 The pan makes thin 3" pancakes and features a monkey, hippo, giraffe, elephant, rhinoceros, lion and alligator. Hosting a Jungle Safari Baby Shower brunch? How cute would these animal theme pancakes look on a plate with fresh fruits and whipped cream? Great jungle safari cake ideas, I know of so many kids who would love this, gotta tweet! This is great - I'm linking this to my safari articles. Hope that is okay with you. These pans are ones I love, too! These cakes look like so much fun to decorate. My sweet tooth is going crazy just thinking about it. These will make such cute animal cakes for a party or even a school event - yum. If you are hosting a race car theme party, you will find a large assortment of cake and cupcake decorating supplies here. Hosting a Rockin' Party? You will find a great assortment of guitar party favors here to send home with your party guests.